This is technically billed as a starter, although could be a salad I suppose, and comes from Roselyne Masselin’s Cuisine Imaginaire. It’s amazingly simple to make and despite the odd combination of ingredients, was pretty tasty. 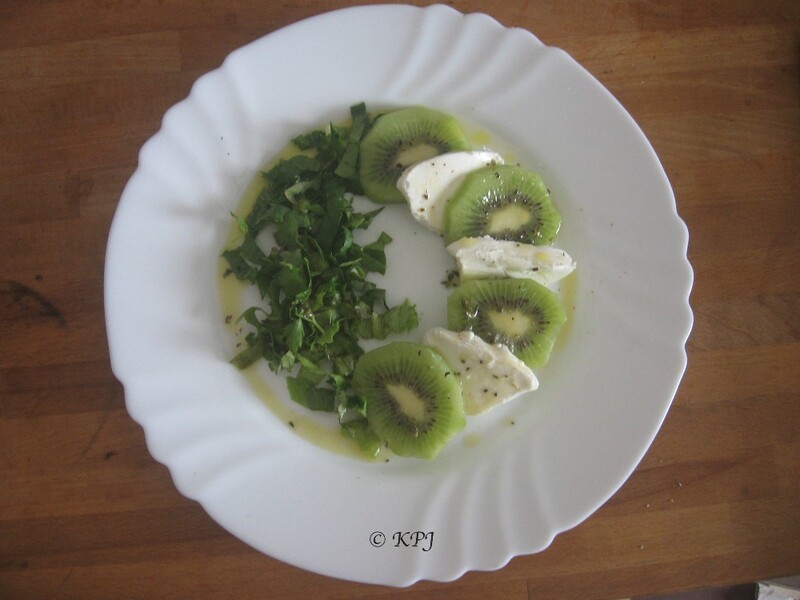 Slice kiwi fruit and goat’s cheese. Arrange on plate so the food forms a wheel. Add salad leaves, Ms Masselin recommends some fancy ones, but I just raided the garden, and ended up with rocket, baby spinach and parsley. Chill in fridge. Mix dressing ingredients, chill in fridge, when ready to serve, pour dressing over salad leaves, kiwi fruit and cheese. I rarely eat cheese, I think it’s a bit yucky these days and doesn’t suit my vegan aspirations. As A does the shopping in Gib :) he buys it for himself, usually mozzarella, sometimes feta or cheddar for a change. Or a goaty one. In Spain we usually go for goats or sheeps. I actually do like the blue ones. I don’t like the ones that have things added though, like dried fruit or whatever. Def yuck. I think I started eating yoghurt in India. Plus, it’s good for a bad guts. There may be a connection there although I never did get a bad guts in India, unlike my travel companion. Oh, I love cheese, but like I said, only Cheddar and Feta. Can’t stand parmesan. That smell is yucky! My father loved the blue cheese. Not for me thanks. I’d rather drink the Probiflora capsules than eating yoghurt. My mother and stepfather loved thick milk – they let the milk stand until it was sour and thick (much like yoghurt) and they would eat it and because I never wanted any – it made me nauseous – she always forced me to wash their glasses afterwards and stepfather would laugh himself silly because I wanted to throw up.